12. CORRECTION! Save the Date! MINORITY SERVING INSTITUTIONS: America's Underutilized Resource for Strengthening the STEM Workforce. Astronomy and Planetary Science are fields with numerous opportunities for naming objects. From the many stars in the sky to the rocks on the surface of Mars, scientists have made many choices about what to call the objects they study. Several recent articles have highlighted the importance of using names that are inclusive and make connections to various cultures. The AAS Climate Site Visit program is getting under way. At the invitation of a department's chair, a three-person site visit team will spend a day and a half with the department, conduct interviews in order to assess the climate, and draft a report. Departments will benefit by receiving constructive feedback from an unbiased team of neutral, highly-qualified peers. Please don’t hesitate to contact the SVOC (see the From: list of this message) if you have questions about the site visit team pool. "At the January 2017 AAS1 meeting in Texas, the AAS Council approved the creation of a Task Force on Diversity and Inclusion in Graduate Astronomy Education. The Task Force consisted of 8 members of the community chosen to represent a wide range of stakeholders and interests. The membership included two co-chairs, one from a Minority Serving Institution (MSI) and one from a research university, liaisons to each of the four AAS diversity committees (CSWA, CSMA, SGMA, and WGAD2), and liaisons to the AAS Board of Trustees. In addition, the Task Force had three advisors, social scientists with expertise in the three main areas of focus of the Task Force: Admissions, Retention, and Data Collection and Metrics for Success. These advisors fully participated in all activities of the Task Force, providing input on the research and practice in support of each recommendation of the Task Force. " I was contacted by CUNYTV for statistics on women of color in astronomy. I pointed them to the CSMA webpage and to the Astrobetter Equal Opportunity Astronomy webpage for the most up to date information. They published their show featuring Moiya McTier a PhD candidate in Astronomy at Columbia. At the end of her segment which runs from 7:00-17:03 you can see the statistics they used. "A new analysis of biomedical awards over five decades shows men receive more cash and more respect for their research than women do, report Brian Uzzi and colleagues." "The Cold Spring Harbor Laboratory (CSHL) has stripped James Watson, the 90-year-old Nobel Prize-winning scientist famous for determining the double-helix structure of DNA with his partner Francis Crick in the 1950s based on research conducted by British chemist Rosalind Franklin, of all his honorary titles after the laboratory deemed his recent remarks on race “reprehensible,” CNN reported this weekend." "Tamara Robertson was the last woman standing on Mythbusters: The Search and hosts SciJinks. 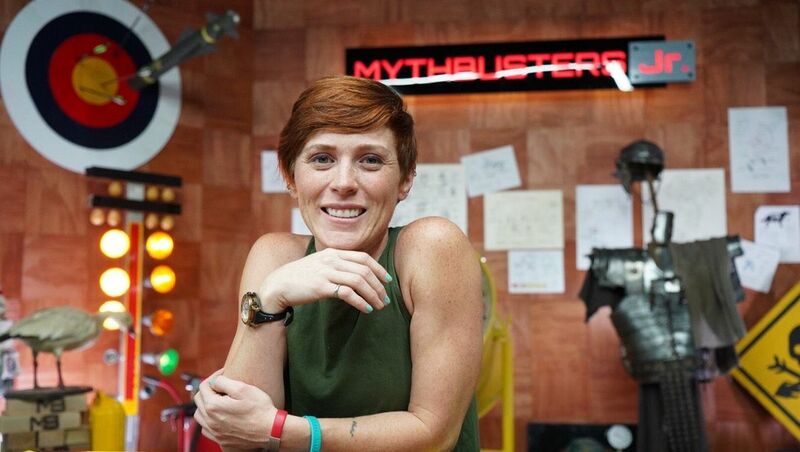 Now she’s taking on hosting duties over on Mythbusters Jr. On top of that, she's also very active in getting young women interested in STEM. We got a chance to chat with Robertson about the new show, the bullying she went through as a kid, and using pop culture to get kids into science." The scientific, engineering, and medical communities have been working towards improved representation of women in science, technology, engineering, mathematics, and medicine (STEMM) for decades. While progress has been made, women (particularly women of color) remain underrepresented in many scientific, engineering, and medical fields, and at many levels in education and career stages. This symposium will seek to understand institutional barriers to implementing practices for improving the representation of women in STEMM, so that those barriers can be removed or overcome. This event will re-visit the major themes of the 2007 National Academies report, Beyond Bias and Barriers, and will examine policies, practices, and strategies that have demonstrated effectiveness in opening doors to women’s participation and success in STEMM fields. Details: March 11, 2019, at the National Academy of Sciences in Washington, D.C.
"There’s no magic, one-stop adviser who’s going to transform your life and your career ... So consider going for the specific advice you need. Shauna Duggins, the first woman to win an Emmy for stunt coordination, for her work on GLOW, has used that approach repeatedly. “I haven’t had one formal person who has been my mentor through my whole career,” she says. “Rather, I’ve had a handful of amazing men and women. ..."
This study was conducted in Australia but shows very interesting results on girls' self confidence. "But even after using AI in its practice, Wikipedia still perpetuated bias and overlooked scientists, many of whom were women. From the total registered biographies of scientists, women constituted only 18 per cent of it. It was also found that between 84 and 90 per cent of Wikipedia editors are male. To resolve this problem, Primer introduced what industry’s first machine-generated knowledge base for scientists that identified these omissions and made it possible for all to not trawl around finding missing names and provide users with a huge amount of well-sourced information in a quicker timeframe." Another Workshop from NASEM. This one's on minority serving institutions.